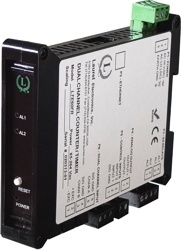 Laureate DC input transmitters provides six voltage input ranges and four current input ranges, all factory calibrated and jumper selectable. The 200.00 mV and 2.0000 V ranges provide a high input impedance of 1 GΩ to minimize the load on the voltage signal. A 5.000A range measures the IR drop across a built-in 10 mΩ current shunt. The transmitters can also easily be scaled in software for use with external shunts. Dual solid state relays for control or alarm, isolated. Rated 120 mA at 140 Vac or 180 Vdc. The relays can respond to digital readings or to received control characters. Note: The same DC signal conditioner can be user configured for DC Volts or DC Amps, and for process, strain or potentiometer follower signals. It is precalibrated in EEPROM for all DC Volt and DC Amp ranges listed.